Jerusalem-The Simon Wiesenthal Center today welcomed the decision by the Tartu Art Museum to remove two highly offensive video clips from an exhibition on the Holocaust which opened this past Saturday. In a statement issued here today by its chief Nazi-hunter, Holocaust historian Dr. EfraimZuroff, the Center commended the decision to remove video clips of naked actors and actresses playing tag in a gas chamber and of a Holocaust survivor renewing his concentration camp tattoo ID number. "We commend the efforts of the Estonian Jewish community to protest the highlyoffensive aspects of the exhibition in the Tartu Art Museum, which complemented our own efforts to achieve this goal. Unfortunately, the rest of the exhibition is of highly questionable value, but at least the most objectionable elements have been permanently removed. This incident should be a wake-up call for the authorities in Tallinn regarding the attitude towards Holocaust-related issues." Jerusalem-The Simon Wiesenthal Center today called for the removal of an exhibition which it believes mocks the victims of the Holocaust and insults their memory and which opened yesterday at the Art Museum in Tartu, Estonia. In a statement issued here today by its chief Nazi-hunter Holocaust historian Dr. EfraimZuroff, the Center expressed a deep sense of outrage and insult in response to images from the exhibition entitled "My Poland: Recalling and Forgetting," which make a mockery of the fate of the Nazis' victims who were gassed to death and the contemporary efforts to commemorate their memory. "While the exhibition claims to attempt to deal with trauma through humor, the result is a sickening mockery of the mass murder of European Jewry and the important ongoing efforts to commemorate the victims' memory and impart the lessons of the Holocaust. Thus, for example, one of the pieces in the exhibition is a film in which naked actors play tag in what is supposed to represent a gas chamber, a shameful parody of the fate of millions of Jews who were murdered in death camps. Such perverted humor has no place in any country, least of all one in which Holocaust crimes were perpetrated not only by Germans and Austrians, but by local Estonian Nazi collaborators as well." Jerusalem-The Simon Wiesenthal Center expressed a deep sense of disgust in response to a “sick attempt at humor” in the most recent issue of the popular Estonian news weekly Eesti Ekspress. Jerusalem - The Simon Wiesenthal Center today expressed a sense of outrage and deep frustration in the wake of the death yesterday in Costa Rica of Harry Mannil, who served with the infamous Estonian Political Police in Tallinn during the initial year of the Nazi occupation and actively participated in the arrest and interrogation of Jews and Communists who were subsequently murdered by local Nazi collaborators, but was never prosecuted for his Holocaust crimes. In a statement issued in Jerusalem by its chief Nazi-hunter Israel director Dr. Efraim Zuroff, the Center emphasized the failure of the Estonian authorities to prosecute Mannil (who was listed as Number 10 on its “Most Wanted List” of Nazi war criminals and as a result of the Center’s efforts was barred from entering the United States) despite the findings of their own investigators regarding his activities in the framework of the dreaded Estonian Political Police, who were responsible for the arrest and murder of numerous Jews and Communists. Jerusalem – The Simon Wiesenthal Center today harshly criticized the recent celebrations held in Estonia to mark the anniversary of the battles between pro-Nazi Estonian forces and the Soviet Army. In a letter sent from Jerusalem by its chief Nazi-hunter, Israel director Dr. Efraim Zuroff, to Estonia’s nonresident ambassador to Israel Aino Lepik von Wiren, the Center noted the participation of Estonian Minister of Defence Jak Aaviksoo and member of parliament Trivimi Velliste, as well as dozens of foreign neo-Nazis who attended the event. “We view these events as a glorification of those who fought alongside the forces of Nazi Germany, the regime which planned, initiated and implemented the Holocaust and is responsible for the mass murder of millions of innocent civilians. Thus glorifying those who fought for a victory of the Third Reich is an unpardonable insult to that regime’s many victims and those who fought to save Europe from its tyrannical rule. “Given these circumstances, we find the participation of Estonian Defense Minister Jak Aaviksoo and member of parliament Trivimi Velliste in these events incomprehensible and worthy of condemnation. In fact, it is totally incompatible with Estonia’s membership in NATO and the European Union. In addition, the fact that these events attracted dozens of foreign neo-Nazis clearly demonstrates the danger that they will encourage the rebirth of fascism and racist extremism. Jerusalem - The Simon Wiesenthal Center today criticized the removal from the center of Tallinn to a military cemetery by the Estonian government late last week of a Soviet memorial commemorating the defeat of Nazi Germany, which had stood for decades in the center of the Estonian capital. In a statement issued in Jerusalem by its chief Nazi-hunter, Israel director Dr. Efraim Zuroff, the Center noted that the removal of the monument minimizes the severity of the crimes of the Holocaust in Estonia and insults the Nazis‘victims in the country. Estonia received an “F” or failing grade in the Wiesenthal Center’s last (2007) Annual Status Report on the worldwide investigation and prosecution of Nazi war criminals, published this month . The Simon Wiesenthal Center today rejected the findings, announced late last week in Tallinn, of the Estonian government's investigation into the activities during World War II of suspected Nazi war criminal Harry Mannil, which cleared the resident of Caracas, Venezuela, of any criminal responsibility and closed his file. The Center, which years ago identified Mannil as a member of the Estonian Political Police, which actively participated in the persecution and murder of civilians in the Estonian capital in 1941, has been trying to facilitate his prosecution ever since he was discovered living in Venezuela in the wake of the investigation in 1992 of his superior Evald Mikson. In a statement issued today in Jerusalem by its chief Nazi-hunter , Israel director Dr. Efraim Zuroff, the Center reiterated its contention that Mannil should be held accountable for his role in the fate of Estonian civilians persecuted and murdered by the Nazis and their Estonian collaborators. The Center also termed “absolutely outrageous” the statement made last Friday by Estonian state prosecutor Heino Tonismagi who, according to the Estonian media, accused the Wiesenthal Center of purposely targeting Mannil (a multimillionaire philanthropist) since he was “one of the most outstanding Estonians,” and absolved the Estonian authorities of any crimes since the country was occupied at the time. In response, Zuroff called the Estonian investigation of Mannil “a pathetic whitewash for political reasons of an active Nazi collaborator who thanks to the ineptitude and/or corruption of the Estonian prosecution will apparently never be held accountable for his crimes.” Zuroff noted that the prosecutor's totally baseless accusation that Mannil was purposely targeted by the Wiesenthal Center is the best proof that Estonia lacked the political will to prosecute a prominent Estonian and pointed out that Mannil is currently barred from entering the United States due to his wartime activities. It is obvious that Estonia , which has hereto failed to convict a single local Nazi war criminal since it regained its independence, still lacks the political courage to face the practical implications of the active complicity of its nationals in Holocaust crimes.” Said Zuroff. 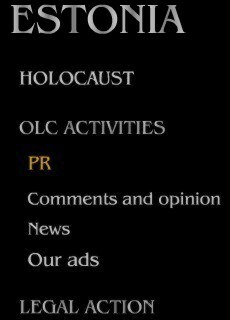 The Simon Wiesenthal Center today expressed its shock and outrage in the wake of a decision by an Estonian advertising agency to refuse to publish ads for the Center's “Operation:Last Chance,” a special project which offers financial rewards of $10,000 for information which will lead to the prosecution and punishment of Nazi war criminals in the Baltics. The ads were rejected by the Estonian advertising agency “Media House” on the grounds that the proposed text which said that “During the Holocaust Estonians murdered Jews in Estonia and in other countries” was inflammatory and that according to the Estonian Security Police Board since no Estonians had ever been convicted for the murder of Jews outside Estonia and the Board did not possess “convincing evidence” of such crimes, the assertion by the Center may be in violation of the Estonian Constitution. In a statement issued today in Jerusalem, the Center's chief Nazi-hunter Dr. Efraim Zuroff, who directs ”Operation:Last Chance” called the decision “totally outrageous,” and “a sad reflection on the inability of far too many Estonians to accept the sad reality of the complicity of some of their nationals in the crimes of the Holocaust.” Zuroff added that he viewed the position adopted by the Security Police Board as particularly problematic in view of the fact that it was the agency entrusted with the investigation and prosecution of Estonian Nazi war criminals. “The Security Police Board has once again shown very clearly that they consider their primary task to be the preservation of the good name of the Estonian people rather than the prosecution of local Nazi war criminals. Given the fact that the International Historians Commission established by President Lennart Meri has confirmed that Estonian police participated in the murder of Jews in Belarus in 1942 and that the Center has found additional evidence to confirm that fact, we stand 100% behind the assertion in the ad. Under the current circumstances, one can only wonder whether an Estonian Nazi war criminal can actually ever be convicted-regardless of the severity of his crimes-in Estonia,” said Zuroff. For additional information please contact: 972-51-214-156. The Simon Wiesenthal Center and the Targum Shlishi Foundation have launched the second stage of their “Operation: Last Chance” campaign which offers financial rewards for information leading to the prosecution and punishment of Nazi war criminals in the Baltics, by initiating an innovative ad campaign which utilizes authentic Holocaust-era photos of Nazi atrocities to urge informants to supply the Center with incriminating information against local Holocaust perpetrators. The ads, which have already appeared in Lithuania and are slated to run in Latvia and Estonia during the coming two weeks, note the tragic fates of the Baltic Jewish communities and the role-played by local collaborators in their liquidation. In Lithuania, for example, the ad noted, “Lithuanian Jewry did not disappear. They were murdered in Ponar (Vilnius), Fort IX (Kaunas), Kuziai Forest (Siauliai) and over a hundred other places of mass murder…”In Latvia the ad, whose publication will coincide with the anniversary of the large-scale annihilation of 30,000 Riga Jews (on November 30 and December 8, 1941), will focus on that atrocity, the worst in Latvia’s history. “Our goal is not only to notify the public about “Operation: Last Chance,” but to inform people about the critical role played by local Nazi collaborators in each of the Baltic countries (as well as in other countries) in the implementation of the Final Solution. In that respect, while our immediate focus is on justice and the prosecution of those responsible, our larger goal is education. Although these countries have already been admitted to NATO, they have a long way to go in confronting their World War II past and the active participation of numerous Lithuanians, Latvians and Estonians in the crimes of the Holocaust, “ said Dr. Efraim Zuroff, the Center’s chief Nazi-hunter and the coordinator of the project. “Operation: Last Chance is designed to arouse the conscience of these societies and help them confront their pasts. It’s about justice not revenge. And therein is an important message for today’s terrorists from Al-Quaida, that the guilty will be hunted for decades, if necessary,” said Targum Shlishi founder Aryeh Rubin.